PRICING: $1,500 (includes beverages and snacks). For those who sign up for this workshop, you will be sent an email containing information on lodging and some delicious local food. 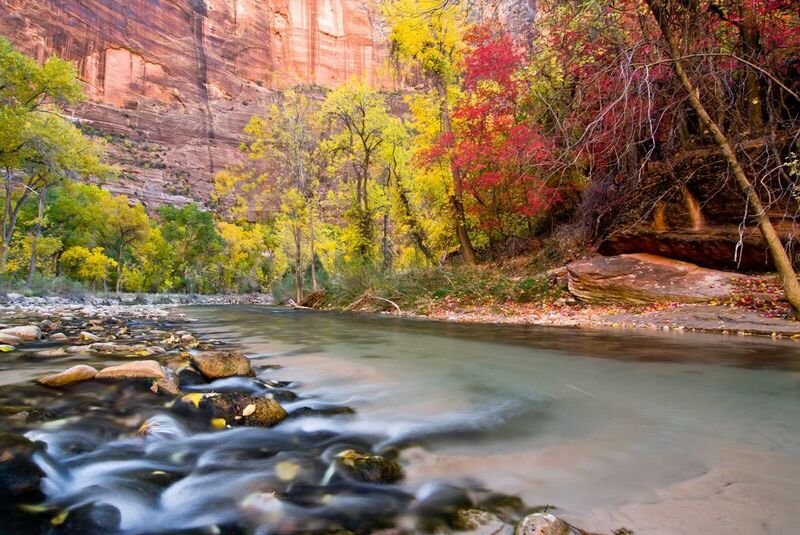 Zion National Park in recent years has gained a reputation as being one of the number one destinations for photographers from all over the world during the fall foliage season. Tripods are seen scattered throughout the park and for good reason. 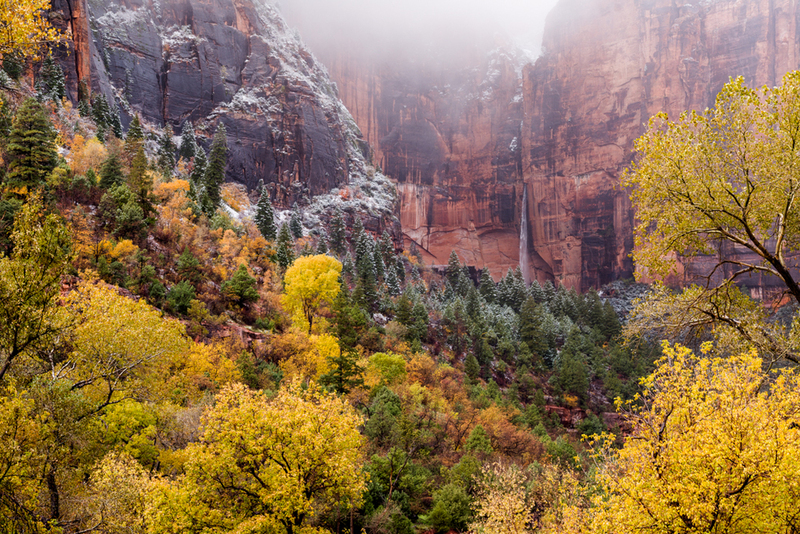 As Zion Canyon prepares to sleep for the upcoming winter it offers us a dramatic blast of showmanship before it rests for a season. Fremont cottonwood trees, maples and oaks create a sensational palette of color that will inspire any photographer. The timing of the change in foliage can vary from year to year. Being local residents to the area, we've found that the first and seconds weeks in November create the best odds for photographers to obtain opportunities to capture the magnificence of this special event that lasts for only a couple weeks out of the year in the main canyon. DAY 1: We will meet at Zion Adventure Company in Springdale, UT at 1PM. We will meet everyone on the workshop and head out for a casual stroll through Zion's scenic canyon. 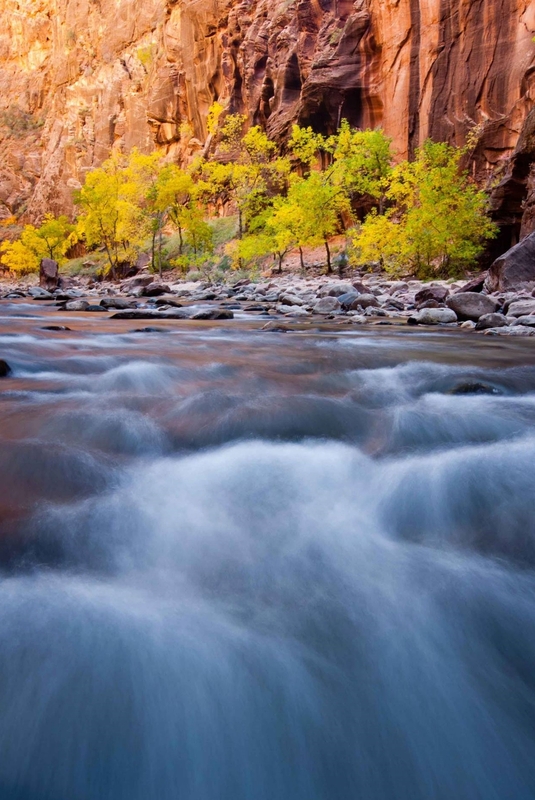 Along the way we will photograph the magnificent colors of the fremont cottonwood trees that line the Virgin River. As many know, typically mid-day light is not the most desirable for landscape photography. With the sun hanging low in the sky during this time of the year, in combination with the multitude of colors we are able to shoot beautiful images using back-lighting and the reflected light of the canyon walls. Then onto Sunset. We will photograph a beautiful view of the canyon, which for some reason or another seems to be overlooked by many so we will likely have very few other photographers in this area. DAY 2: Arise for sunrise. We will visit one of the iconic photo locations of the park, and then move onto the more obscure. After shooting sunrise for a couple of hours we will head into "The Narrows". The narrows is the largest slot canyon in the world. To get an idea of what this hike and experience look like please click here. 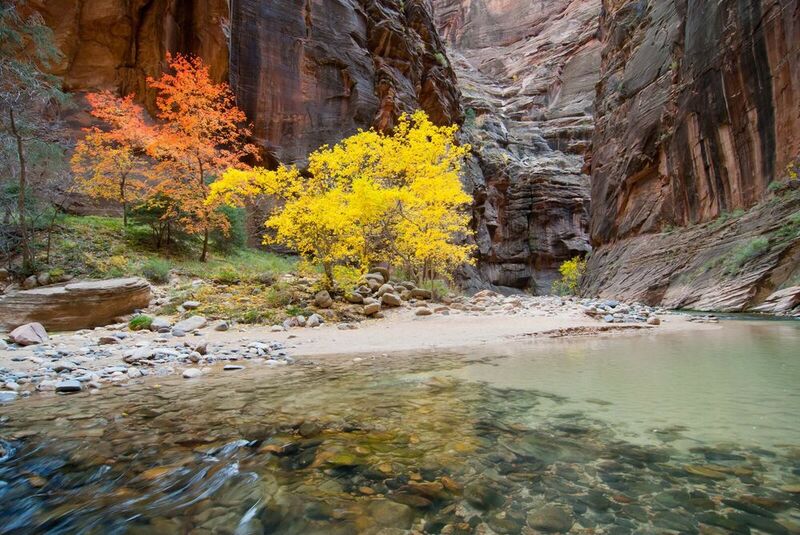 Fall is my favorite time of the year to shoot the narrows for two reasons. First of all, it sees beautiful soft light that lingers for a long time, offering a shooting experience that allows you to take your time and be patient, not having to worry about out-racing the light. Second of all, the colors of the fall foliage mixed with the canyon walls and the brilliant glow of the canyon walls makes for mouthwatering images. 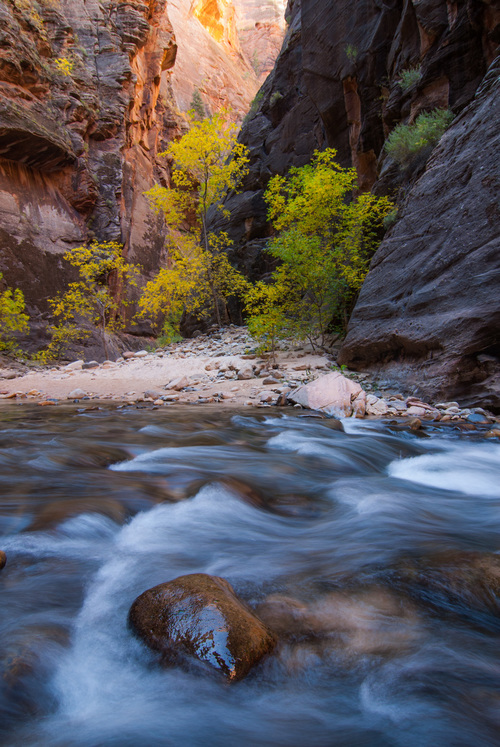 NOTE: Due to Zion National Park regulations, there is no guiding permitted into the "Wall Street" section of the Narrows by any photography workshop providers. Please be aware that all Narrows images you have seen on this website are in areas that we can guide you to. From here we will split up. Due to park regulations, there are a number of areas that can not be visited while on photography workshops. I will share my local knowledge of the area with you to help you get the best images during your visit. These are images you'll want to obtain, and it is well worth splitting for people to do sunset on their own this evening. After the sunsets, we will caravan up to Bryce National Park to spend the evening up there in preparation to photograph Bryce's world-class sunrise. DAY 3: Arise and photograph the sunrise in Bryce National Park. After the light has turned harsh we will make our way back to Zion. Along our trip we will make a detour to photograph a small portion of one of the most photogenic slot canyons in Utah. On our way back through Zion National Park we will take advantage of the opportunity to see and photograph big horn sheep on the east side of the park. We will then move on to photograph the sunset in one of the many obscure shooting locations that few know about! Prepare to "ooh and ahh" when you see you the grandeur of the park from these lesser-known perspectives of the park. DAY 4: One more sunrise in Zion. On this final day, we will sit together after the light gets too harsh to work on production of the images we photographed throughout the workshop. The program that we will process in will be the most up-to-date version of Adobe Lightroom. Questions? Feel free to contact us here. Daily photo tours for every level of photographer!